Audio Walk & Laundromat Service. 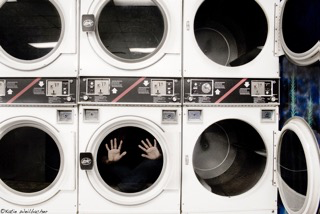 Life can sometimes feel like a long laundry list that you struggle to get through. *Sigh. If this is you, doing the laundry can be a great opportunity to refocus on your core strengths and build resilience into your day. Walking to the Laundromat is an audio walk that combines mindfulness practice with doing the laundry in an attempt to explain the interconnections between service economy, emotional capital, and affective labour from the perspective of the artists exceptional labouring body. The audio walk will commence at a location to be advised once your reservation is confirmed. The main activity will be conducted at the Washingdone Laundromat (209 Enmore rd. Enmore) will go for 75 minutes. There will be a brief discussion with the artist at the conclusion of the event. Spaces are extremely limited. If you are interested in attending this group walking session please rsvp and a meeting point will be sent to you your email. It will be a short distance from the laundromat on Enmore Road. BYO 1 bag of dirty laundry as this is required in the piece. You will need to download the track onto a hand held device, from this website and also have your own headphones to participate. This audio available for download from friday 29th April. BIO: Rebecca Conroy is an interdisciplinary creature working across site, community engagement, and performative interventions through artist led activity and philosophy. Her work is bound up in mimetic strategies and the playful occupation of non-art fields such as urban planning, economics, and housing, particularly where it concerns the behaviour of cities and the rise of the creative entrepreneur and finance capitalism. She has previously worked in the role of Festival Director (Gang Festival), Associate Director (Performance Space); Provocateur (Splendid Arts Lab & Artist Wants a Life) and has been the co-founder and co-director of two artist run spaces in Sydney, The Wedding Circle and Bill+George. From 2011 – 2014 she was conductor of The Yurt Empire, a rogue housing project and encounter in the inner city of Sydney. She was also critical writer on Temporary Democracies and has worked with dlux media arts as science+art community engaged researcher. She has been widely published on topics ranging from artist led initiatives, site based experimental practice, and contemporary performance. Currently she is working on three projects: A Very Beautiful Laundromat that experiments with the feast and famine economy of the artist in the form of an artist run laundromat, a radio work based on a series of dates with economists, and an ongoing radical archiving project with a collective of artists with library tendencies called The Librarium.